In the spring of 1968, the defending Stanley Cup champion Toronto Maple Leafs failed to make the playoffs. While many players remained from the championship team, some key players such as Terry Sawchuk, Red Kelly, Frank Mahovlich, Carl Brewer, Bob Baun and Ed Shack were gone. Among remaining Leafs, 5 were aged 37 or older. The team would need a rebuild, and over the next few years, there would be a lot of turnover. Many would say the rebuild following the 1967 Cup win is still going on today. 1968 – #10 Brad Selwood D. Through a combination of a draft order that alternated between divisions, Montreal’s option to select 2 French-Canadian players, and declined picks by other teams, the Maple Leafs’ first selection came in the number 10 position. It was the only choice they’d make in the draft, selecting Brad Selwood, a 20-year-old defenseman from OHA Niagara Falls. Curt Bennett, a centre drafted by St. Louis at #16, would be the only draftee following Selwood to play significant NHL games (585 GP, 152G, 182A). A Memorial Cup winner, and teammate in Niagara Falls of Phil Myre and future Leaf Rick Ley, Selwood was traded to Vancouver of the WHL with Rene Robert for Ron Ward, before he’d have a chance to play an NHL game. Ward would play 18 games for the Leafs before being drafted by Vancouver in the expansion draft, and Selwood was returned to the Leafs for cash in 1970. As an NHL rookie, Selwood played 28 games for Toronto, and looked like he may have a future on a young defense corps that included Jim Dorey, Rick Ley, Mike Pelyk and Jim McKenny. Verdict: By 1970, Harold Ballard was in control as owner of the Maple Leafs. For Ballard, only 2 things mattered: making money, and making sure he always looked like he was in charge. When the WHA came onto the scene, the Maple Leafs were easy pickings for the start-up league, as Ballard simply refused to pay based on the big salaries offered to his players if they made the jump. In fact, Ballard believed few players would leave the NHL, especially the Toronto Maple Leafs, and even if they did, the WHA couldn’t possibly last more than a season at most. Selwood would play 100 games as a Leaf, scoring just 6 goals and 27 assists before the WHA was able to pry him loose in 1972. Toronto would leave him unprotected in the 1972 intra-league draft, and his NHL rights went to Montreal (who would have to wait until 1979 to exercise them). Selwood would be a decent WHAer, playing over 400 games, and winning a WHA Avco Cup. He could have been a major piece of the Leafs’ rebuilt young defence corps, but as with many of the Leafs’ young players post-1967, the franchise allowed his jump to the rival league, and eventually allowed his rights to go for nothing. 1969 – #9 Ernie Moser RW. In 1969, Punch Imlach was replaced by Jim Gregory as GM of the Maple Leafs. In his first draft, Gregory made a really poor first round selection in Ernie Moser from Estevan. A decent junior right wing, Moser would not play a single NHL or WHA game. Between the Leafs’ choices at #9 and #20, the following players were selected: #10 Jim Rutherford G (151 wins), #11 Ivan Boldirev C (1000+ games, 850+ pts), #12 Pierre Jarry RW (300+ games), #13 JP Bordeleau RW (500+ games), #14 Dennis O’Brien D (almost 600 games), #17 Bobby Clarke C (Hall of Fame, 2 Stanley Cups) and #18 Ron Stackhouse D (almost 900 games, 450+ pts). Moser played 8 seasons of minor-pro hockey. Verdict: By 1969, the Maple Leafs had holes to fill in their roster as veterans of the 1967 Cup winner had retired, been traded or drafted to expansion teams. While it is true that Bobby Clarke’s diabetes made him a risky choice at the time, the Leafs obviously missed out on a number of better choices. Rutherford and Jarry would go on to play short periods of time with the Leafs. The 7 players named went on to be solid NHL players, and any of them could have helped the franchise in its efforts to rebuild into a perennial contender. 1970 – #8 Darryl Sittler C. The Leafs redeemed themselves with the selection of Darryl Sittler from the London Knights. Though he was never able to win a Stanley Cup nor individual NHL award, Darryl Sittler is regarded by most as the premier Toronto Maple Leaf player of the 1970s. He served as team captain following the departure of Dave Keon, and was named to the 1977-78 NHL 2nd All Star Team. He led the Leafs in scoring 8 times, his 117 pts in 1977-78 was a Leaf record (surpassed by Doug Gilmour), and his franchise totals of 389 goals and 916 points were team records (since surpassed by Mats Sundin). But 1976 saw probably the 3 greatest achievements of Sittler’s career. In February he recorded 6 goals and 4 assists to set an NHL record of 10 points in one game during an 11-4 win against Boston. In April, Sittler tied an NHL record by scoring 5 goals in a single playoff game against Philadelphia. And in September, he scored the Canada Cup winning goal against Czechoslovakia. Darryl Sittler finished his NHL career with 1096 games played, counting 484 goals and 637 assists for 1121 points. Verdict: Though quite a deep draft, the Leafs selected the best player available in Sittler. Only Gil Perreault (Sabres – #1) has played more games or scored more points for their career. 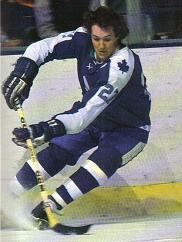 Sittler was the leader on a team many felt was only 2 or 3 players away from challenging seriously for the Stanley Cup. A bona fide point getter, he was also known to mix it up a little having 948 career penalty minutes. Unfortunately, the Leafs of the 1970s were also dominated by Ballard. Pal Hal always found ways to get himself into the news, and from time to time this included feuding with his players. By 1979, Ballard hired back Punch Imlach as GM. Imlach attempted to keep Sittler and goalie Mike Palmateer from participating in the CBC’s ‘Showdown’ segments. Neither Ballard nor Imlach had any love for Sittler’s agent, Alan Eagleson. Among many moves to keep his team in line and undermine Sittler’s influence, Ballard had Imlach trade Sittler’s friend Lanny McDonald to Colorado, causing Sittler to renounce his captaincy. In the end, Darryl had enough and asked to be traded. He was sent to Philadelphia in exchange for Rich Costello, Hartford’s 1982 Round 2 pick (Peter Ihnacak), and future considerations (Ken Strong) on January 20, 1982. Together, Costello and Strong combined to play 27 NHL games, all with Toronto, having 4 goals total. Ihnacak did go on to play 417 NHL games, all with Toronto, over 8 seasons. He finished with 267 points. There are rumors of deals that would have sent Sittler to Buffalo for Gil Perreault or to Philadelphia for Rick MacLeish, but in the end, the Maple Leafs wound up sending their best player away in return for very little. In fact, while Ihnacak posted 267 points, Sittler himself scored 205 points in Philly and Detroit before retiring. Darryl Sittler did eventually return to the Toronto organization in 1991, and has held positions as consultant to the General Manager as well as Community Representative. Overall: The 3 drafts profiled here are something of a microcosm which describes the ups and downs of the Toronto first-round draft history. Brad Selwood was a good defenseman, and a potential integral part of the future had he not been mismanaged out of the organization in return for nothing. Ernie Moser was simply a miscalculation, a player who for one reason or another did not make it to the lineup, and subsequently, the Leafs passed on a number of players who could have made the team better. Darryl Sittler became Toronto’s first drafted star, the face of the Maple Leafs through the 1970s, and an amazing performer until ultimately he was marginalized and traded, yielding very little back in return.